Leave it to Chance is one of a number of excellent independent comics available today. Like Astro City, it is published under the Homage imprint. Homage Comics is Image Comic's line of independent creator owned comics, and everything I've seen them publish has been quite unlike the standard Image and Wildstorm comics. Leave it to Chance chronicles the adventures of Chance Falconer, the teenaged daughter of Lucas Falconer, occult investigator, battler of demons and protector of the city of Devil's Echo. Creator James Robinson has described Chance as a cross between Nancy Drew and Kolchak, the Night Stalker, and it is Chance that makes this book so special. In a day with very few heroes and few strong independent women characters, Chance is a heroic teenaged girl. Her companion, the young dragon St. George may seem familiar to fans of the X-men of a decade or so ago. He is rather like Kitty Pride's dragon companion, Lockheed. 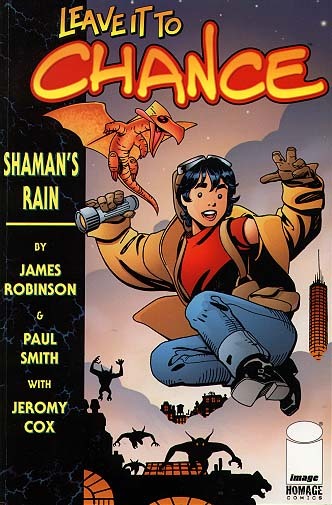 This isn't too surprising as Paul Smith created both of them, and they are both variations of the dragon and is girl companion that he created years ago, before entering the comics world. Both the writer and the artist have clearly contributed to the vision of this book and love what they're doing. I fell out of comics a few years ago, It wasn't until I'd figured out why that I could come back. I'd stopped believing. Not in comics per se but, in what they'd become, Dark misogynist, convoluted...mean. No more heroes. No more fun. For the first time in my life, "here" was better than "there." Yuk! Leave it to Chance runs counter to all of that. Chance, her father, and George are all heroic in the full sense of the word. Devil's Echo may have a dark and occult heritage, but the setting is far from dark, grim and gritty. The art is beautifully drawn, a careful balance between being cartoony and realistic. The picture of Chance to the right shows what I mean. The line style is fine and clean, much like the better "good girl" artists -- Adam Hughes, Dave Stevens or Matt Haley. The faces are individual and expressive, the posing active. This shot of Chance is one of the most realistic in the book. The cover shot (above) is perhaps a bit more typical. Notice how dynamic the figures are and the cartoon-like dots for eyes on Chance. I recommend this comic for all the reasons that it is different: because it is fun, beautifully drawn, well told, because Chance is young, eager, female and heroic, because it is a labor of love and that shows, because it is inventive and creative and at the same time harkens back to and plays upon the mythos and traditions of the comics, books and popular fiction. The first four issues have been collected in a graphic novel. The fifth issue came out a couple of months ago, and the sixth is due Real Soon Now.